Here’s the back story: The Dwarf mining operation was the economic center around Lonely Mountain, driving trade in the area’s human and elf communities, and creating a trade hub extending out into other parts of Middle Earth. 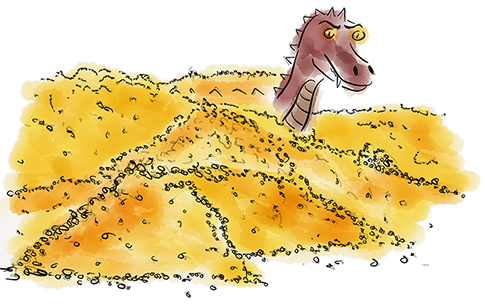 The Dwarf King Thrain went insane and started hoarding so much gold that he drew the attention of the dragon Smaug. Dragons have a strong gold fetish, and Smaug especially so. He attacked the Dwarven community and drove them out, halting the mining operation and destroying the town of Dale, throwing the region into an economic tailspin. About 200 years later, Thrain’s son Thorin returns with a band of Dwarves and the Hobbit Bilbo Baggins with a scheme to drive out Smaug and reclaim the Dwarf mountain city and mines. The first problem I see is that Smaug’s attack and victory over the Dwarf city sparked an economic depression from which the region failed to recover. Without the mining operation to drive the economy, and Smaug’s refusal to release any gold back into the local market, there wasn’t an infrastructure to support new economic growth. Watching the movie and seeing the massive hill of gold coins and other artifacts so deep that it could completely bury the giant dragon drove home just how much money had been pulled out of the local economy. Instead of seeing Thorin’s promise of prosperity for everyone once Smaug was driven out, I saw the setup for hyper inflation. Where a meal costs, say, one gold coin in the artificially limited currency under Smaug’s reign, it could easily jump top five, ten, or even a hundred coins once the hoarded gold was dumped back into the economy. Instead of bringing a new age of prosperity to the region, Thorin would create an economy where you’d need a wheelbarrow filled with gold to buy your groceries. No one would have enough money to pay for even the most basic essentials, and poverty would run unchecked through the community. Yes, I’ve read The Hobbit more than once, and I know how Thorin’s plans work out. No, I won’t give any spoilers because that’s just not cool. And now I’m left wondering what kind of person watches a big screen fantasy adventure movie about Dwarves, Hobbits, and dragons, and thinks about the economic implications of a gold hoard instead of whether or not our heroes will survive their dangerous adventure. Oh, right. That would be me. This entry was posted in Entertainment by jeff. Bookmark the permalink.